Pride of Ownership! This home is just like new! Upgrades throughout! Backs to a small open area. 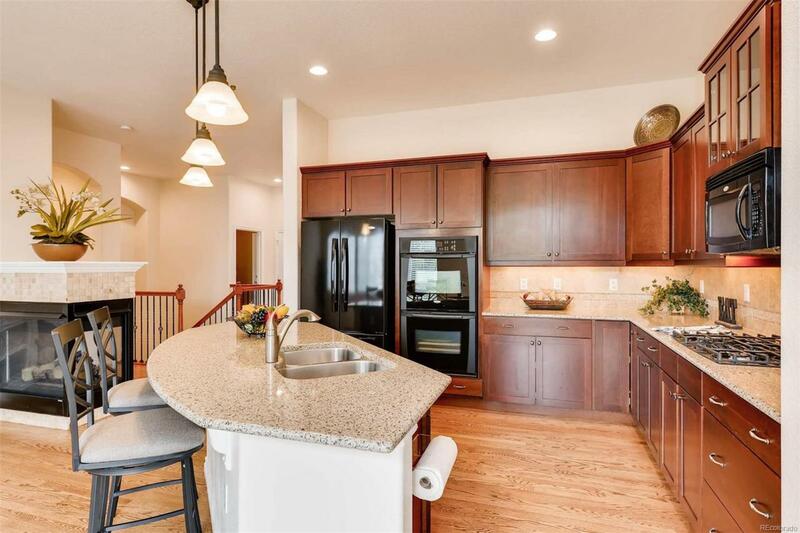 Newly Stained and Refinished Hardwood Floors, New Interior Paint, Spacious Kitchen with Cherry Color Cabinets w/under Cabinet Lighting, Pantry, Slab Granite, Convection Double Oven & 5 Burner Gas Cooktop. Large Island with Seating. 3 Sided Gas Fireplace with Stone Tile accents, Upgraded Lighting, Large private Master Suite with a walk in tub with a separate sitting area and walk in closet, Formal Dining Room could easily be converted to an Office, Tech Desk with Slab Granite, Finished Basement with an extra large Rec Room, 2 additional nice size Bedrooms, 3/4 Bath and lots of storage. Basement could easily be converted into a Mother in Law Suite. Garage is over sized and has a floor coating.The back patio is nice sized & a Low maintenance yard! Close to DTC & I-25. You won't be disappointed! !